While most guys put a lot of thought into what unique gadgets and games they’ll fill their man cave up with, they often forget about one of the most important pieces of furniture there is. Sofas are a must-have in any man cave. These spaces are designed to be a fun and relaxing space to gather with friends. You won’t be able to get comfortable on any old ratty couch. The perfect man cave couch will have all the features you need to relax. These couches will have enough room to accommodate a group of guys without feeling cramped while also being soft enough to lounge around when you want to get away from it all. Of course, the perfect couch will also express your own personal style. When looking for the right couch, there are a number of things to consider. When it comes to couch style and shape, the possibilities are endless. You may have grown up with a standard over-sized couch that could fit your family as you gathered around the television. However, modern couches are much more versatile and complex. There are numerous designs available, each with their own unique features. Some are made for lounging while others are made for socializing. 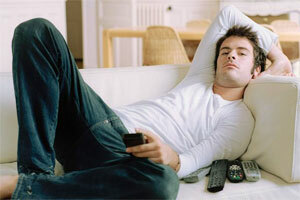 Despite the wide variety of couch types on market, we’ll be looking at the four most common for man caves. Sectional sofas are the modern equivalent of the family couch of yesteryear. Depending on the size and manufacturer, they can fit a large number of guys with no problems. These sofas are typically comprised of three to five separate pieces. The various pieces can be arranged in any way, allowing you to customize the sofa to your space. Sofas with more pieces will have more configuration options. The most common configurations of sectional sofas include the “U” and “L” shape. U-shaped sofas are great for gathering around a tv or projection screen. The various seats wrap around an empty center, which can be used as an ottoman or coffee table. L-shaped sofas are a bit smaller and typically have a side that’s specifically designed for lounging. Recliner sofas combine the best features of traditional recliners and modern sofas. Chances are, you had a father that spent his evenings on his beloved recliner. Recliners are perfect for kicking your feet up and lounging around, so why not make them into a sofa? These sofas can feature up to 3 different reclining mechanisms. 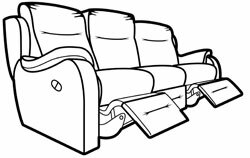 With a simple pull of a lever or push of a button, the back of the sofa will recline down and a footrest will pop up. Essentially, these sofas are multiple recliners pieced into one large sofa. The best part about them is that they look like an ordinary sofa. When not in use, the reclining portions fit seamlessly into the design. Each reclining seat acts independently, so one person can kick back while others sit normally on the same unit. Modern pull-out sleeper sofas have evolved quite a bit in the last few decades. They’re not the same uncomfortable clunkers from the 1980s. New models have ditched the traditional mechanism to improve operation and comfort, regardless of whether you’re sitting or sleeping on it. These sofas look like any other sofa. However, they house a full-sized bed underneath the seat cushions. The mattress and frame fold up and slide into the body of the sofa. The back remains stationary regardless of the position. In the past, the bed portion featured an uncomfortable wire support. 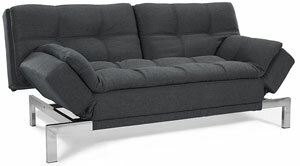 Today’s pull-out sofa beds utilize thick foam padding as the mattress. A durable telescoping frame keeps everything stable. It’s a great solution for visiting guests or when you just need to take a nap. If you’re looking for an option packed with comfort and features, a home theater couch may be for you. These units are designed to provide maximum comfort while you’re in front of a projector screen. They’re often oversized and house a number of extra features. Thick armrests with accent lights aren’t uncommon. Many even have integrated cup holders, additional storage, and power positioning controls. In terms of design, these couches look like multiple high-quality recliners stitched into one. Each seat has its own separate controls and armrest. 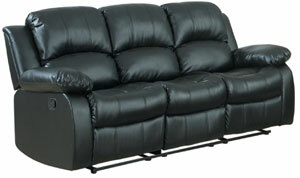 These couches are very versatile and vary in style and functionality based on manufacturer and price. The color of your new couch can have a huge effect on the overall space. It’s a big piece of furniture that will probably be visible throughout the room, so you want to consider your color options. The choice of color isn’t just about aesthetics. While you may be tempted to just choose your favorite color, it’s good to understand what the color of your new couch says about you and the space. Your choice of color can say a lot about your personality. While most don’t realize it, people subconsciously associate specific colors with different types of personality traits. Your man cave is supposed to be your space, so why not make your couch represent you as a person? Chances are, you already gravitate towards the colors that match your personality. People who share the same favorite colors often share similar traits. If you’re a fan of neutral colors, you can go with brown, black, or white. Brown means that you’re practical while white represents peace and organization. Black is similar in the sense that it shows that you’re conservative, however, it also means that you have a creative side. Colors like red, orange, and yellow are more lively. Red shows determination and often means that you’re goal-oriented. Yellow is an outgoing color that also goes with persuasive and controlled characteristic traits. Orange, one of the most vibrant colors of the spectrum, shows that you are energetic and happy. Finally, there’s blue and purple. Blue means that you’re cautious and analytic while purple is comforting and represents dignity. Not only can colors represent your personality, but they can change your mood. While the presence of certain colors won’t make you go into a dramatic tailspin, they can create a unique vibe. Color psychology plays a big role in furniture design, which is why couches in neutral colors are typically easier to find. Neutral colors like black and white are versatile and don’t create much of a specific feeling, which is perfect for an area where you’ll be watching television. Cooler colors like blue, green, and purple will make a space feel calm. On the other side of the spectrum, warm colors like red, orange, and yellow will create a feeling of energy and vibrancy. You can easily choose a couch to make your man cave appear bigger or smaller. It’s all about pairing the couch with the color of the walls and ceilings to change the way a room feels. If your man cave is on the smaller side, go with a light-colored couch and walls. Interior designers often use this method to trick the mind into thinking a space is more spacious. Alternatively, brighter colors will draw the eye’s, making a large space appear to be more intimate and cozy. If done correctly, you can make your man cave feel the way you want it to. Of course, you need to consider the overall size of your couch in relation to the man cave. Despite the wide variety of styles and types of couches available, most follow a very similar sizing template. The perfect dimensions of a couch are used by a number of different manufacturers. These dimensions have a great track record of being comfortable regardless of the use or people sitting on it. 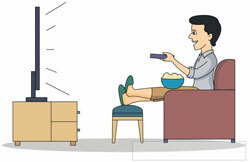 The perfect couch is 40 inches deep, 60 inches long, and 36 inches high with a seat height of 19 inches off the ground. While these dimensions are widely regarded as perfect, there are some exceptions. Typically, the depth and height will stay relatively unchanged. It’s the length and seat height that vary. You may want to go with a longer couch to fit more people in or so that you can lounge and take a nap. In terms of seat height, it’s important to consider the height of your ceiling. If you have a lower ceiling height, you may want to go with something that’s a bit lower to the ground. This will make the room appear taller and more spacious than it really is. If your room is big, a shorter couch will look tiny. Instead, go for something with a high back. Couches come in a range of different fabrics. While it may not seem like an important decision, the fabric of a couch will determine it’s longevity and overall cost. Fabrics also play a big role in the look of the couch. When choosing a couch, it’s important to consider the uses of the piece and think practically. Because it’s going in your man cave, you may want to forgo delicate silk or linen. Instead, you should opt for an option that will stand up to the test of time and provide optimal comfort. Here are some great fabric options. You can’t go wrong with leather. 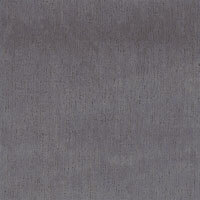 The natural fabric is durable, easy to maintain, and has a rugged look. It’s a very popular material for couches, especially those made for man caves. They have a natural appearance that’s comfortable and resilient. Not only that, but the material tends to improve in quality the older it gets. Instead of worrying about you couch becoming stiff and unpleasant, a leather couch becomes softer and more supple with time. If you’d rather go with a synthetic option, faux leather couches are available. They have a lot of the same characteristics as natural leather in terms of comfort and quality. 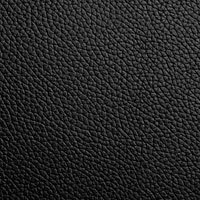 However, synthetic leather tends to be more durable. It has more protection against sharp objects than real leather. Microfiber is a great option if you’re looking for something a bit more affordable without sacrificing quality. The material is made from fine polyester, making it very soft. The fibers are woven very tightly, making it resistant to abrasive damage. It can withstand some wear and tear with no problem. In terms of maintenance, microfiber is one of the best. The fabric doesn’t attract dirt and dust, making it very easy to keep clean. This fabric is a bit posher than other options, but that doesn’t mean that it’s any less durable. In fact, it’s much stronger than many alternatives. The fibers are tightly woven for strength. It’s typically made from a synthetic material, such as rayon. Despite this, the material is often used for luxurious couches due to its elegant appearance. Couches made with acrylic fabric are very durable. It’s a synthetic material that has fibers that resemble natural wool. The fabric is even soft like real cotton. However, it defeats cotton when it comes to stain, wrinkle, and fade resistance. You won’t have to worry about constant upkeep, as the material basically takes care of itself. It’s durable enough for regular use and can last for years. Now that you know what to look out for, here are some our personal favorites on the market. These couches will fit into any man cave and provide you with the best in comfort and relaxation. This versatile couch from Serta can be configured in a variety of ways. The frame is made from solid steel, ensuring that it can adequately support sitters. The cushion is made from a thick pillow top rather than a traditional spring. The entire unit can be moved and adjusted. The backrest can be pushed down to transform the couch into an extra sleeping area. The arms can also be adjusted and laid flat to make room for more people. It measures roughly 80 inches wide. 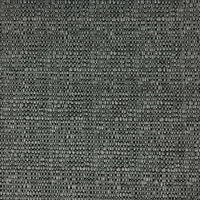 The modern couch is covered in a durable cotton fabric that’s dyed to be a neutral charcoal gray. From Homelegance is this mammoth of a couch. It features two reclining seats, but can comfortably fit three people. The middle seat doesn’t feature a reclining mechanism. Covered in black bonded leather, these seats are durable and luxurious. The sides utilize faux leather. In total, the couch measures 83 inches wide and approximately 39 inches. high. The two reclining seats use a lever to push the back down and prop the footrest up. However, a power reclining option is available. The armrest, seat, and backrest are all overstuffed with high-density foam. This makes it easy to get comfortable as you enjoy your man cave. If you’re going for a modern and futuristic look, this white sectional sofa may be for you. Rather than the traditional “U” or “L” shape of modern sectionals, this sofa is curved. It comes in two curved sections for easy assembly. One side has a low-profile armrest while the other has a sleek built-in table. It measures 117 inches wide and 36 inches high, which is plenty of room for a group of guys to relax. The entire unit is covered in white bonded leather. The backrest is stuffed with thick foam padding and features a tufted design. This sleek sectional sofa can accommodate a full party. It features ample seating and a chaise lounge. The various sections form together to form a “U” shape. On both ends of the sectional, the designers incorporated small storage in the armrest. The entire sectional is clad in 100% Italian leather that’s colored white. 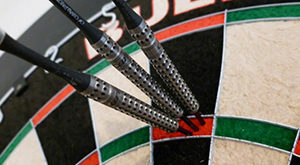 This material is very high-quality, so you can expect ultimate comfort and durability. Two adjustable headrests are built into the back. It measures roughly 11 by 14 feet in size. However, it has a low profile of only 35 inches. The entire unit is supported by polished stainless steel feet to round off the modern look. This L-shaped sectional sofa is packed with a number of great features. Not only does it have a cool modern look, but it’s incredibly functional. There are two reclining seats on both ends, cup holders built into a folding backrest, and seven adjustable headrests. In total, it can comfortably seat 7 people. In terms of look, this sofa features a bold two-tone design. The main seats are covered in black while the armrests, headrests, and body are covered in red. It also has a unique circular design. The sofa utilizes leather throughout and futuristic chrome legs. No man cave is complete without the perfect sofa. Whether you want a standard sofa for a few guys or a beast of a sectional to seat your entire gang, the perfect option is out there. With a wide range of styles, colors, fabrics, and sizes, you can easily find a sofa to fit your man cave.